Primum non nocere is one of the principal precepts of medical ethics, "First, do no harm." What would happen if Congress followed this maxim? Many have predicted economic mayhem if the Super Committee fails to reach agreement and sequestration is triggered, but Panderbear wonders, why? According to James Horney of the Center on Budget and Policy Priorities, if Congress went home and did nothing at all it would lead to $7.1 trillion in deficit reduction in the next 10 years. 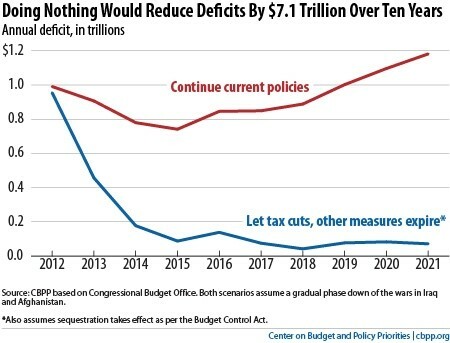 The chart, based upon Congressional Budget Office (CBO) data, shows just how effective a "do no harm" approach by Congress to the deficit combined with President Obama's PAYGO rules would be. The deficit would be reduct to a small fraction of GDP within 3 years. $0.9 trillion in lower interest payments on the debt. To be sure following this "do no harm" approach would be painful, but Panderbear thinks it would be a lot less painful than the draconian cuts to social programs with no increases in revenues that Republicans have demanded. When you're in a hole, stop digging. Sometimes that's enough.